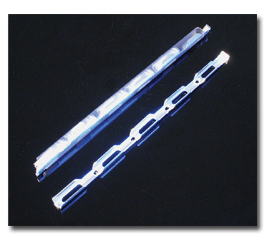 We recommend that you use the Hampton CrystalCap Magnetic and vial system with 22mm fixed sample holder length (18mm pins) and presents a 10-character identification code (data matrix on the basis of the caps + clear node near the data matrix or on the rim of the cap). The complete system is marketed as the Hampton CrystalCapHT. 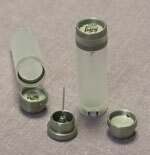 The system includes vials, caps and loops. It is important to keep the loop to crystal size proportional to reduce background scatter and ease of crystal visualization for crystal centering. When shipping samples include an empty loop to prepare the sample environment correctly on the beamline. In order to minimize damage of the crystals upon transport we recommend you to store the vials on 5 vial-cryocanes made of aluminum and offering a base tab for proper seating of the vials. We recommend you to surround the cryocanes with plastic sleeves which maintain the samples in place within the canes even upon big shocks during transport. 3-5 days prior to shipping samples charge the shipping dewar with liquid nitrogen and check that liquid levels are maintained. Just prior to shipping container empty liquid nitrogen out and place samples into basket and close lid. Secure the lid with a paper clip or twist tie to ensure the lid does not pop open during transportation. 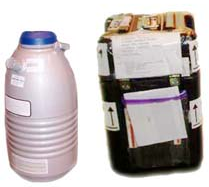 Place dry shipper into transport case and secure lid properly. Be sure to label container "Ship Upright " and "Non-hazardous".